Tick Control Service: There are countless species of ticks found throughout the world and several in the Suffolk county area. The most common are Deer ticks, American Dog ticks, and Lone Star ticks. 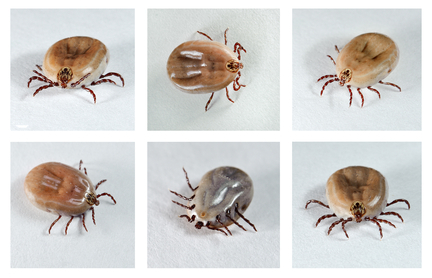 Ticks have been known to spread diseases, viruses and tick-borne illnesses to their warm blooded hosts. 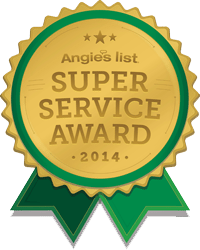 Luckily, there is Suffolk County Pest Control to come to the rescue for Suffolk County locals, as well as all five New York Burroughs and Nassau County. Our professionals are expertly trained and have years of experience to properly identify ticks, locate and exterminate them. Due to the health threats ticks pose, it is prudent to avoid them whenever possible. Not all ticks can transmit diseases and just because you discover one leaching off on you, doesn’t mean you have been infected, although we recommend seeking medical aid for professional diagnosis and potential treatment. Ticks do not jump incredible heights nor do they fly as most people have come to believe. They often transfer onto their warm blooded host when the unsuspecting victim brushes by a blade of grass where they have climbed upon waiting to execute their ambush. 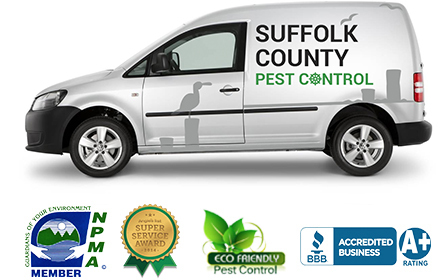 Suffolk County Pest Control professionals know their devilish ways, what their habits are and the likely places they lurk when not attached to their preferred host. Deer ticks generally only live 2-3 years, and consist of 3 cycles. Females lay eggs, usually from May through September and the eggs then hatch to larvae. The larvae are not born with diseases but generally will pick them up on their host. Larvae usually attaches to smaller animals like mice or birds, they molt into nymphs after their bloody banquet and become dormant until the following spring. Nymphs are about the size of a poppy seed, and when they awaken, they look for their next meal. If they are disease free at this stage, they can still inherit diseases from their second host. Finally in the second year, the nymphs will molt into adults. Females will mate and feed, lay their eggs and die but if they do not feed, they will be dormant until the following year. Deer ticks are found in wooded areas and await their host on low growing vegetation. Deer ticks are responsible for Lyme disease among others. American Dog ticks prefer grassy fields or meadows with little to no tree cover. They spread Rocky Mountain spotted fever and Tularemia. American dog ticks have similar life cycles, but adult males will consume blood where the deer tick male does not. Lone Star ticks have been getting the spotlight recently, as their populations are growing rapidly. They too have similar life cycles of the previously mentioned ticks, and can transmit a buffet of diseases and ailments. The females carry a distinctive white star shaped mark on its back. If you, a loved one or a pet is believed to have been bitten by any tick, you should seek medical treatment. 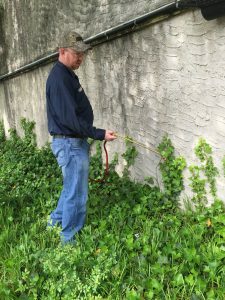 Our experts at Suffolk County Pest Control have had experience in treating homes, businesses and outdoor properties to exterminate the ticks. With our expertise and utilizing premium products and equipment, out tick control service is beyond satisfactory. Call us today to schedule you’re a[appointment!